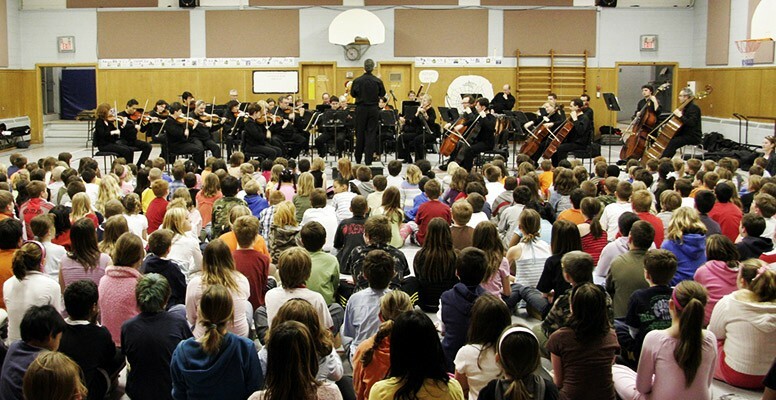 Symphony Nova Scotia’s full orchestra regularly visits schools across Halifax each year. Our 45-50 minute school concert program is designed to give students an opportunity to experience the full symphony orchestra in a fun and engaging concert. Please see contact information below if you are interested in having Symphony Nova Scotia come to your school! Symphony Nova Scotia is happy to present the in-school concert – Fast, Faster, Fastest! – this fall with our musicians led by education specialist Gary Ewer. Why does fast music sound so exciting? Like a roller coaster speeding around a course, it can sound as though the music might go flying off the rails. When Symphony Nova Scotia plays fast music… look out! Anything can happen! For more information about booking a concert for your school, please contact D’Arcy Gray at darcygray@symphonyns.ca or 902.403.7197.